The K-Bye-Bye display head by Tech Lighting combines minimal design style with high-functionality. This unique display head is specially designed for the Kable Lite system allowing for cable separations of 3.5” to 8”. Arms can be adjusted to rotate individually and the Bye-Bye head can be rotated a full 360° allowing for direct light beam in the desired location. The K-Bye-Bye is compatible with a myriad of accessories that further enhances its performance and style. This dynamic display head is ideal for commercial lighting applications such as retail stores, libraries and galleries. 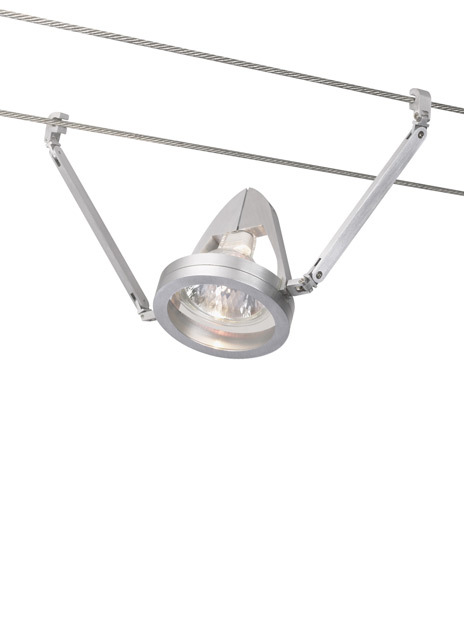 The K-Bye-Bye accommodates a fully dimmable MR16 lamp (sold separately). For cable separations of 3.5" to 8". Lamp rotates 360°. Satin aluminum finish. Low-voltage, MR16 lamp of up to 75 watts (not included).